So, I love my Nook. I love the touch screen navigation, and the convenience of having a library at my side at all times. I love to browse the Barnes and Noble website, looking for new books. I would and have recommended the Nook vigorously to anyone who’s asked about it. And all of a sudden, Barnes and Noble’s financial woes become crystal clear. One of my neighbors is a LOLcat. 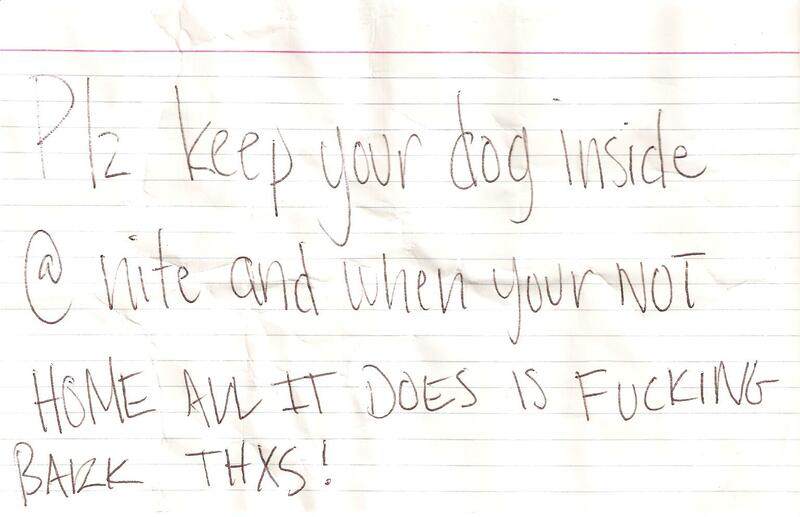 Shocking, I know, but how else would you explain the note left on my door today? We’ve got the cutesy handwriting and the purposeful misspellings (unless the author of this note honestly can’t spell “please”, “night” or “thanks”, in which case, she has bigger problems than a barking Lulu). The random swearing and the passive-aggressive nature has me confused, though. These weren’t qualities that I normally attributed to LOLcats. If we were to look at option number two, I’d almost think that this was a Mormon schoolgirl who knows she’s not going to get in trouble for swearing at a stranger if she remains anonymous. I think she failed to take into account the fact that the random swearing and the misspelled words make me much less likely to take this seriously than if she had taken a respectful tone. I’m sorry about Lulu. I’ve been working on keeping her quiet for the past three years. It has gotten much better, I promise, although I do acknowledge that we have a long way to go yet. 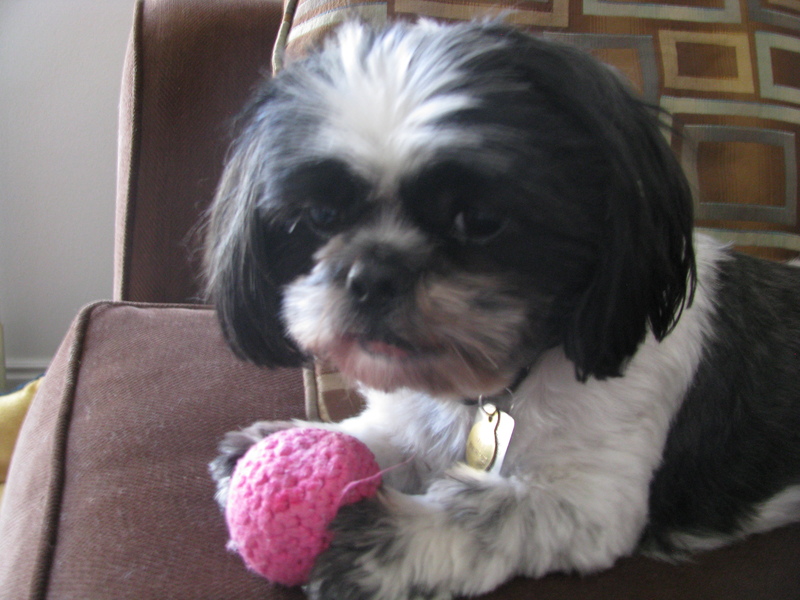 I would like to keep her inside all day, but there are times when I can’t be home to take her for a walk before she needs to relieve herself. This is the reason I have the dog door onto my balcony, so she can go outside, in the little yard I had built for her, and not on my carpet. Again, I apologize for her noisy behavior. We are working on it. I wish you had told me who you are so I can explain this to you in person, and not on my obscure blog that you probably aren’t going to read. What? Two posts in one day? Cori, are you feeling okay? Upon giving myself a few extra minutes to get to the bus stop, I stopped and checked my mail. This has become a regular thing since starting school. I think I must be confusing the hell out of the mail-lady. Do. Not. Want. Also: I'm really bad at opening envelopes. Cue the hasty exit of any sense of calmness and rationality. As I was waiting for the bus, I left the mail in the mailbox, with the plan of picking it up on the way back from school. 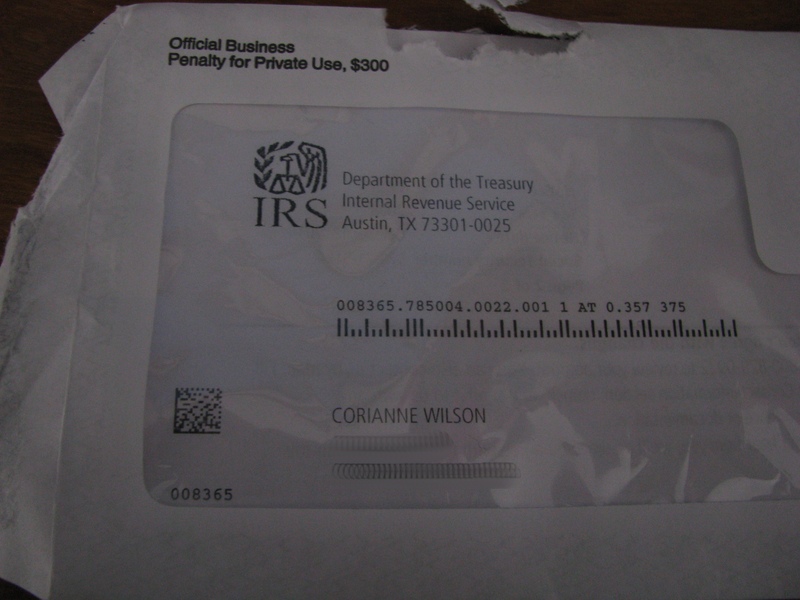 And, for some reason, (crazy, huh) I couldn’t stop thinking about this letter from the IRS. Why were they sending me a letter? It’s not a check, it’s a letter. What do they want? 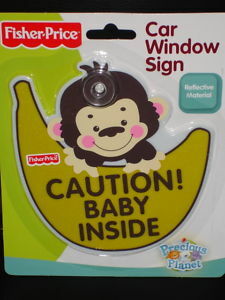 This could be really bad. But, if it was really bad, it would have been a certified letter, or someone would have come and knocked on my door in person, right? That’s what happens on TV and in the movies, right? They just sent me a check for $37. Do they want their $37 back? I already spent it. Okay, so it wouldn’t be hard to find another $37… and so on and so forth. Finally (I missed the bus I wanted to get on, but that’s okay because it was running early, so I wasn’t late for class or anything) I went back to the mailbox and pulled out the letter. I figured if I was going to be freaking out, I might as well see if there was something worth freaking out over. It could be nothing after all. Never mind that even when it’s nothing, in my head, it’s never nothing. 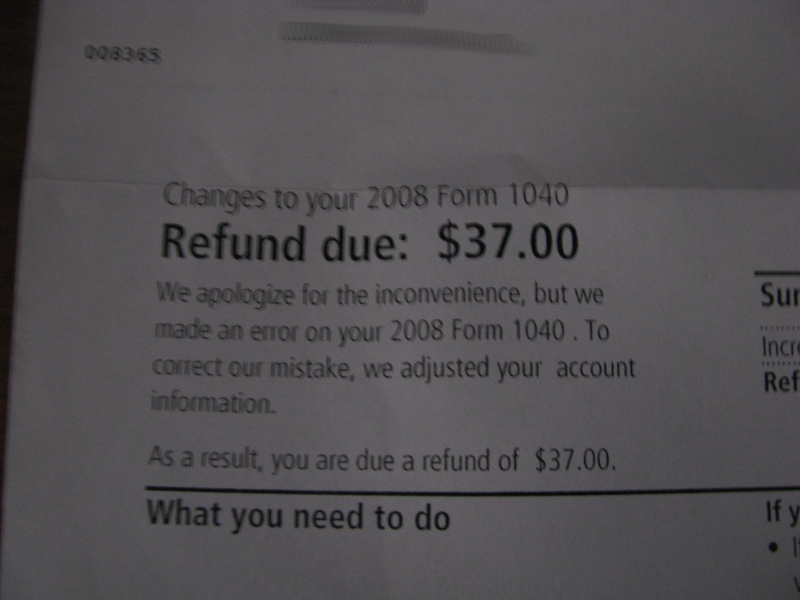 So, instead of including a note in envelope with the check for $37, they sent me another piece of mail, telling me that they sent me a check for $37. Bureaucracy, folks. I actually went to sleep at a decent time, then woke up when both dogs, having been “mysteriously” forced off the bed by someone who is an active sleeper (whoops) started barking at me to let them back on the bed. I then decided that I wasn’t going to go back to sleep, because of the heartburn, and the runny nose, and the general lack of sleepiness. That’s okay, I’m a hypochondriac, and have the medicine collection to prove it. 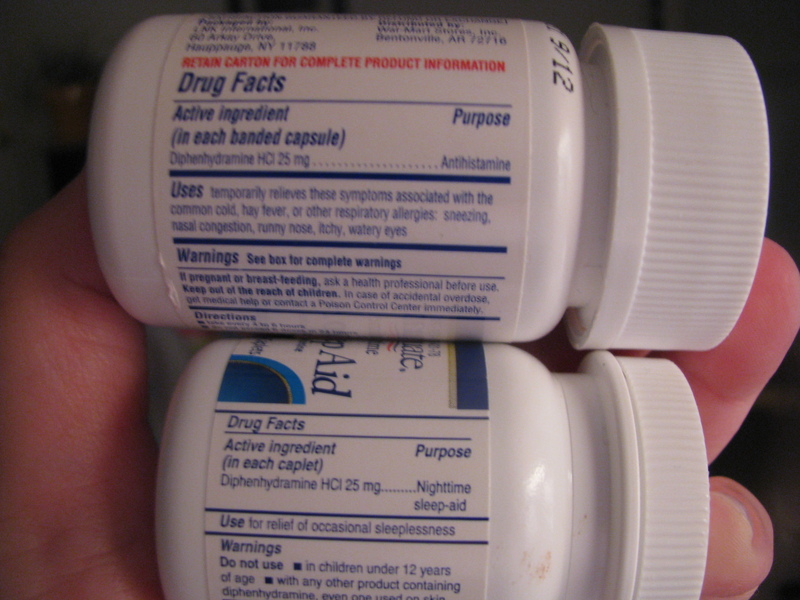 Okay, it’s hard to see, but they contain the exact same amount of the exact same medicine. Wal-Mart, I’m feeling ripped off. Granted I don’t really know why, I doubt I paid more than $3 for either bottle of pills, and they each came with 100 capsules. 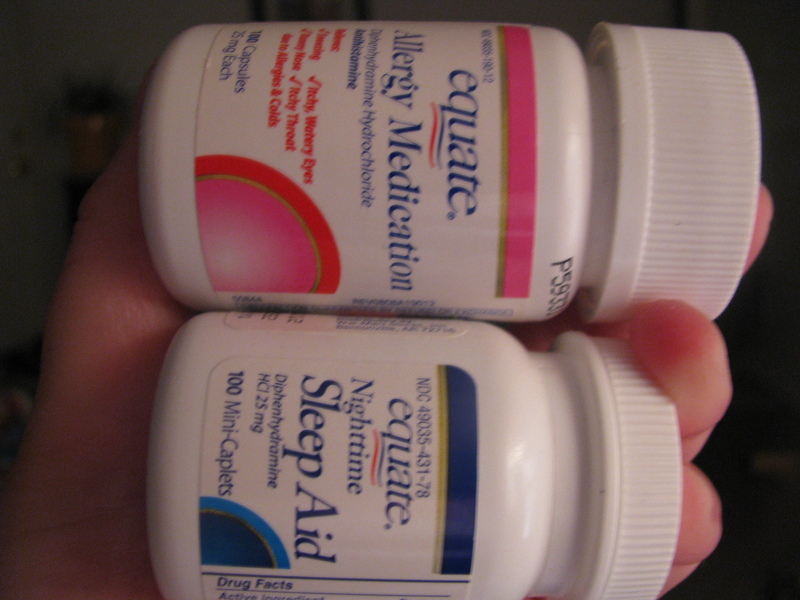 For the record, the sleeping pills won, just because they’re smaller. And now I’m sitting here with the jingle from the Friskies commercial where you get a cat’s eye view of a catnip trip stuck in my head (you know the one) waiting for it to kick in enough that I can go back to sleep.